Smart and moving. I want a companion volume that looks at women. But, really, a compelling and evocative book. New Orleans is like the Canary Islands, home to cultures that evolve independently from the rest of the world. The local brass bands -- the descendents of 19th century oompah bands that along the way crossbred with funk and hip-hop beats -- are a prime example. Roll With It puts these remarkable bands in in their larger context (the focus is on Rebirth, Soul Rebels and the Hot 8), while also being timely in reporting on post-Katrina changes in brass culture. Consider it an essential field guide to sounds of the city's streets. This is ethnomusicology, written from field study inside the first and second lines on New Orleans brass bands--from the day jobs as music teachers building a next generation of musicians, to the etiquette of funerals, the acoustic claiming of public space and the status accorded to successful band leaders. It is particularly striking that the routes taken by bands often ignore 1960s destruction of black neighborhoods and feature cathartic moments at key points under interstate overpasses and other places urban renewal attempted (not entirely successfully) to obliterate. A book about the brass bands of New Orleans and how they have evolved in recent years, to some extent in a way at odds with the traditions from which they started. Several well-known bands are followed and one learns about jazz funerals, second line parades, New Orleans love affair with music, and the often dangerous culture in which the musicians live. The passion these musicians develop for music, at a young age, is also readily seen. A very entertaining and educational read. New Orleans brass band culture is on display here. Like the city itself, brass bands are in a constant flux of tradition and innovation and they, somehow, manage to maintain both beautifully but not without struggle. 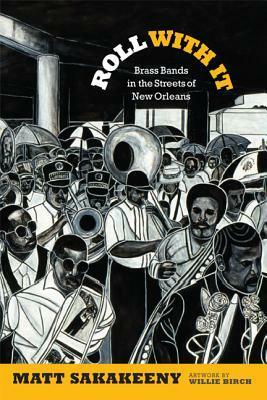 A sensitive and original examination of New Orleans's brass bands and brass-band culture. I learned a lot, not only about the cultural economy, formal and informal, but also about race, representation, and appropriation. My only complaint: no samples of the music to listen to!Definitely enjoyed this book and illustrations; definitely recommend. Matt Sakakeeny - Matt Sakakeeny is Associate Professor of Music at Tulane University, and the author of Roll With It: Brass Bands in the Streets of New Orleans, also published by Duke University Press.